Platanthera praeclara was first documented by the Lewis and Clark expedition in what is now Wyoming. It is presently known to occur in Manitoba, Minnesota, North Dakota, Iowa, Missouri, Nebraska, and Kansas, but has been lost from Wyoming, South Dakota, and Oklahoma. Platanthera praeclara is rare today because of the widespread conversion of its native prairie habitat to agricultural uses. It is known to survive in ten Minnesota counties, but has not been seen in Houston, Freeborn, or Kandiyohi counties for many years and has likely been extirpated from those areas. The species' decline has become so critical that it was listed as state endangered in 1984 and federally threatened in 1989. Platanthera praeclara was subsequently listed as endangered under the Species at Risk Act in Canada in 2003 and added to the IUCN Red List in 2008. Platanthera praeclara has a showy open raceme of up to 24 white to creamy white flowers, each with a long nectar spur. The lip, or lower petal, of each flower is deeply 3-lobed and fringed. The single, smooth stem is up to 85 cm (34 in.) tall. Flowering plants have 3 or more smooth, elongate leaves. Nonflowering plants have 1-3 leaves of similar appearance. A more common member of the same genus is P. lacera (ragged-fringed orchid). This species has a narrower, more compact spike of pale, green-white flowers about half the size of those of P. praeclara, and its petals are more linear than those of P. praeclara. The sepals of P. praeclara are deflected downward behind the lip, and the lateral lobes of the lip are raggedly fringed almost to the base. Platanthera praeclara occurs almost exclusively in remnant native prairies and sedge meadows. The majority of sites occur in full sunlight on moist, calcareous till or sandy soils. None of the sites have a significant history of cattle grazing, although a few have a history of intermittent mowing for wild hay. Platanthera praeclara appears above ground between late April and early May in southwestern Minnesota and from early May to mid-June in the northwestern part of the state. It senesces in late September, or earlier if soil moisture is abnormally low. In late summer, a single bud is produced on the fleshy rhizome. That bud will remain dormant until the following spring when it will develop into the aerial stem. If the bud is damaged in the interim or fails to develop, no stem will be produced that year. Even without the stem, the rhizome may survive and produce another bud in late summer, which will develop into a stem the following year. But this requires exceptional nutritional reserves, and if the plant fails to produce a stem for two consecutive years, mortality is indicated. Similarly, if the emerging shoot of a flowering stem (which contains the apical meristem) is damaged by fire, there are no dormant buds in reserve and it cannot resprout that year. The rhizome must survive that year without any photosynthetic capacity, and it must produce another bud for the following year. If the bud or emerging shoot is damaged the following year, mortality will likely ensue. In one case, a plant was observed to flower 4 years after appearing above ground for the first time, but it would ordinarily require longer. Individual plants in Minnesota monitoring plots have persisted for as long as 15 years, including reappearances after years when they were not above ground. To date, documented pollinators are all Sphingid moths whose proboscis length must match the length of the nectar spur on the flower. Known pollinators in the northern part of the species' range include the bedstraw hawk moth (Hyles gallii), the wild cherry sphinx (Sphinx drupiferarum), the Achemon sphinx (Eumorpha achemon), and the non-native spurge hawk moth (Hyles euphorbiae). Not all flowers are pollinated in any given season. In Minnesota, pollination rates observed in 2003 ranged from 8% to 30% of flowers. The best time to search for P. praeclara is when it is in flower from early to mid-July. Identification is possible after that, but not as easy. Factors contributing to P. praeclara's establishment and survival are not well understood. Drought lasting more than one year is known to severely increase mortality and reduce flowering of surviving plants. It is also known that plants do not persist when flooded for extended periods during the growing season. Cattle grazing has also proved damaging to populations of P. praeclara and its habitat. Cattle will not only graze directly on the orchids, they will trample the sensitive habitat and facilitate the invasion of non-native species that may be impossible to control. Annual mowing of wild hay presents another problem as it removes the seed capsules of P. praeclara before the seeds are ripe. Because this species reproduces entirely by seed, annual mowing could lead to reproductive failure, and eventually, population collapse. The effects of fire must also be considered. Before settlement, the prairie habitats of P. praeclara were exposed to wildfire at intervals of perhaps 2-4 years. While fire was necessary for the proper function of the prairie ecosystem, native prairie has now been reduced to tiny, isolated fragments that no longer function as an ecosystem. In an effort to restore ecological function to these isolated fragments, fire is often reintroduced on a prescription basis. Prescribed fire can be very useful in managing P. praeclara habitats, but timing is absolutely critical. No fire should occur after the orchids are above ground. This has been as early as mid-April in the south and late April in the north but the timing may vary, especially with unknown variables such as climate change. If the growing tips of P. praeclara are even 5-7 cm (2-3 in.) above ground, they may be damaged or killed by a fire. The species has a very limited ability to resprout if the growing tip is killed, and often mortality ensues. At least two poorly-timed burns have resulted in severe damage to important populations of P. praeclara; damage that will take years to recover. Fall burns may have the same effect as mowing. They may destroy the seed capsules before the seeds can be fully dispersed, so it is recommended that burns be limited to early spring. Several sites of P. praeclara occur on publicly owned property, or on property owned by private conservation organizations. This is a positive step, yet none of the sites are currently managed for the primary benefit of this species. This has led to conflicts and, in a few cases, unnecessary damage to healthy populations. It is essential that core populations of P. praeclara be designated and managed in accordance with practices that are known to enhance populations and habitats of this species. Collicutt, D. R. 1992. Status of the Western Prairie Fringed Orchid (Platanthera praeclara) in Manitoba. Report to the Committee on Endangered Wildlife in Canada (COSEWIC). 39 pp. + figures + tables. Cuthrell, D. L. 1994. Insects associated with the prairie fringed orchids, Platanthera praeclara Sheviak and Bowles and P. leucophaea (Nuttall) Lindley. Thesis, North Dakota State University, Bismarck, North Dakota. 76 pp. Davis, S. K. 1995. National recovery plan for the western prairie fringed orchid, Platanthera praeclara. Prepared for the Endangered Plant and Invertebrates of Canada Project, Canadian Nature Federation, Ottawa. 23 pp. Johnson, K. L. 1985. Another new orchid: the prairie white fringed orchid (Platanthera leucophaea). Manitoba Naturalists Society Bulletin 8(2):12. Kiefer, G. K. 2003. Report of activities relating to the effects of management practices on the Western Prairie Fringed Orchid, Platanthera praeclara, at Pembina Trail Preserve Scientific and Natural Area, Minnesota. Unpublished report to The Nature Conservancy, Minnesota Chapter. Pleasants, J. M., and S. Moe. 1993. Floral display size and pollination of the Western Prairie Fringed Orchid, Platanthera praeclara (Orchidaceae). Lindleyana 8(1):32-38. Sheviak, C. J., and M. L. Bowles. 1986. The prairie fringed orchids: a pollinator-isolator species pair. Rhodora 88:267-290. Sieg, C. H., and A. J. Bjugstad. 1994. Five years of following the western prairie fringed orchid (Platanthera praeclara) on the Sheyenne National Grassland, North Dakota. Pages 141-146 in R. G. Wickett, P.D. Lewis, A. Woodliffe, and P. Pratt, editors. Proceedings of the Thirteenth North American Prairie Conference. Department of Parks and Recreation, 6-9 August 1992, Windsor, Ontario, Canada. Smith, W. R. 1993. Orchids of Minnesota. University of Minnesota Press, Minneapolis, Minnesota. 172 pp. United States Fish and Wildlife Service. 1996. Platanthera praeclara (Western Prairie Fringed Orchid) recovery plan. U.S. Fish and Wildlife Service, Fort Snelling, Minnesota. vi + 101 pp. Westwood, A. R. and C. L. Borkowsky. 2003. Sphinx moth pollinators for the endangered Western Prairie Fringed Orchid, Platanthera praeclara, in Manitoba. Journal of the Lepidopterist's Society 58(1):13-20. Wolken, P. M. 1995. 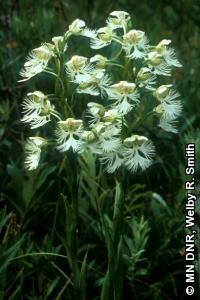 Habitat and life history of the western prairie fringed orchid (Platanthera praeclara). Thesis, University of Wyoming, Laramie, Wyoming. 93 pp. Zelmer, C. D., and R. S. Currah. 1994. Ceratorhiza pernacatena and Epulorhiza calendulina spp. nov.: Mycorrhizal fungi from terrestrial orchids. Canadian Journal of Botany 73:1981-1985.